MICHEÁL MARTIN HAS said Fianna Fáil will provide a ”real alternative” to this pre-election “spin” of Fine Gael and Labour. During his opening speech at the party’s 76th Ard Fheis tonight, Martin was critical of several government policies, but focused on the health service in particular. He said that staff morale has “collapsed” due to funding cutbacks and and hospital waiting lists. Martin said the government can longer blame former health minister James Reilly since they “fired” him, adding that his successor Leo Varadkar more interested in photo opportunities than dealing with issues. He singled out the government’s plan to introduce universal health insurance (UHI), describing worse than water charges and the local property tax. Martin said the government are wrong to base UHI on the Dutch model, saying experts in the Netherlands ”confirmed that an average family with two incomes is paying almost €6000 in health insurance premiums”. Health Minister Leo Varadkar described Martin’s analysis as “odd”. “Our long term plan on universal health care will see the first concrete steps this summer with GP care without fees for the youngest and oldest, and better chronic disease care. “Fianna Fáil’s health policy wants to keep to a flawed system exactly as it is and pour more money into from higher tax. It’s the same old Fianna Fáil. Tax and spend. No reform,” Varadkar said. Martin said that Fine Gael and Labour have been trying to “buy their way out of unpopularity” for the past year and a half. He said next week’s spring financial statement will “allow them over the next few days to announce all sorts of giveaways without actually having to cost or implement them”. Let them keep going on this, because the more they do it the more people can see through the myth of their claim to have turned around the public finances. Earlier in the evening, Martin laughed off suggestions that this could be his last Ard Fheis as Fianna Fáil leader. He insisted he would be telling delegates that Fianna Fáil is “ready for the next general election”. “The task really for us is to ensure that the debate is on the substance of the issues that effect people in their daily lives,” he said, and not “the last poll, the next poll, and the one after that”. Certainly not, How dare you? That’s very cheeky. Delegates voted in favour of introducing a new method of electing the party’s leader (whenever that may be). The new rules extend the vote to all of the party’s 20,000 members, councillors, MEPs, senators and members of the national executive. However, some people weren’t happy that the vote took place when just a small crowd of delegates were present. Martin said this weekend’s gathering would probably be the largest political event of the year with some 3,000 delegates expected at the RDS this weekend. Fundamentally our message is ‘An Ireland for all’. We believe this government, in the implementation of its policies, has created social division, has divided the country and has left many many people and communities behind, in terms of a two-tiered economy that has been allowed to develop. He said this was particularly manifest in areas like health and education and in communities across the country. During his speech, Martin said that every one of the party’s 20,000 members “has the right to feel proud of the core traditions of our party”. Four years ago most commentators predicted we were finished – something they often forget. But we are again the largest party in local government and whenever Enda Kenny finally decides to go to the country we will be ready for him. “In only a handful of years we’ve implemented within the party our biggest reform since we were founded. Already there has been a huge amount of work done preparing for the next election,” stated. He also paid tribute to former party leader Albert Reynolds who passed away last August, saying he was “a true peacemaker”. On the Siteserv controversy, Martin said the government’s response, in asking the IBRC’s liquidators to examine the deal, was “a fundamental error of political judgement”. It is incredible that the government would go down this route… and I think many people are aghast at the idea. The Fianna Fáil leader insisted that a Commission of Investigation would be much speedier than the “two-tiered approach” being adopted by government. He claimed that in asking KPMG to examine Siteserv and other IBRC deals it was “almost teed-up to come up with a particular outcome that the government might want”. Email “Micheál Martin has a pop at Leo, who is having none of it”. 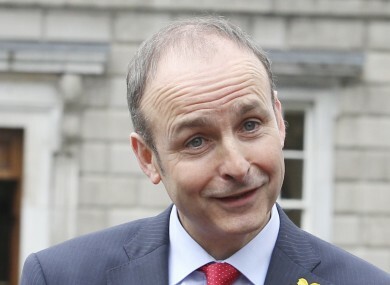 Feedback on “Micheál Martin has a pop at Leo, who is having none of it”.